The rainy season in Japan is about to start now that it's June, and funnily enough, we're having our own "rainy season" here in Toronto. (Kicked off by the inconvenient, yet fantastically funny, Union Station flood last week.) 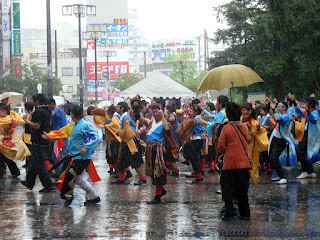 The rainy season is one of the things that I don't miss about Japan. While I actually love rain and there's a ton of charm in going for a stroll in it (plus, it always fell straight down, unlike the sideways rain of my hometown on the East Coast), the long rainy season was pretty awful. 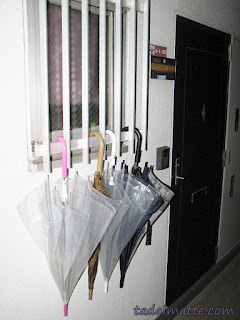 Laundry never dried right, and I hated going to school by bicycle in the wet, and when I woke up on a rainy tsuyu day I would have to quickly get ready and head out to the train station a full 20 minutes earlier than normal to avoid having to bike. On the bright side, this gave me lots of opportunities to walk back after school with my students or with my co-workers - Shelley and I enjoyed many Friday melon pan runs like this. I also was able to own a contingent of adorable umbrellas that I was forced to leave behind when I returned to Canada. Had I known how expensive umbrellas were here (again, sideways rain, so there was no point in owning one before I came to Toronto), I would have brought them all home. Another positive to the rainy season was that, with that predictable weather, the underground shopping complexes and shōtengai, covered shopping streets, became a big draw for me - of course, and for hundreds of thousands of other Osakans! It's likely that tsuyu is one of the reasons that we have such an extensive network of covered areas. There was something pretty fantastic about being able to stroll for kilometres without having to face the elements, but still being outside, in the case of the covered shopping streets. 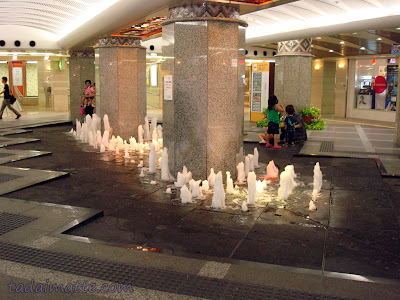 As for the underground, I know I would never have been able to explore the tunnels of Umeda and Namba nearly as thoroughly if the draw of a sunny day was just outside. I wish the PATH system here was even 1/10th as efficient and exciting as the shōtengai of Osaka! Namba NanNan, one of Osaka's first underground complexes.